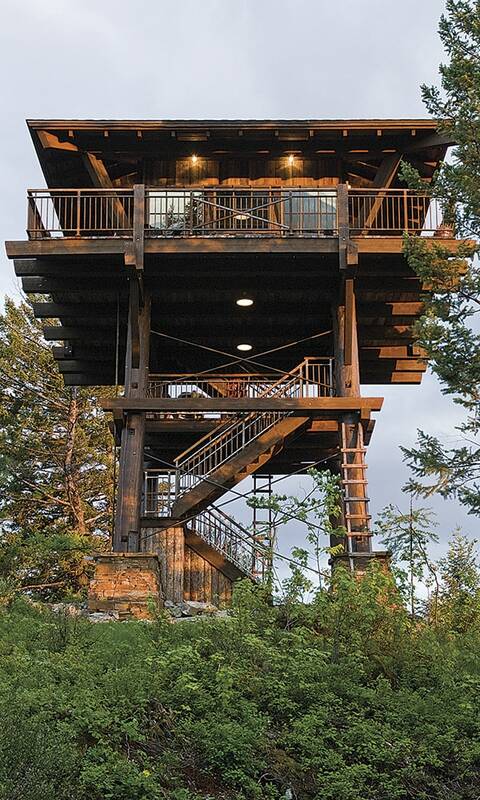 With reclaimed materials and vintage hardware, an ambitious couple builds an authentic wildfire lookout guesthouse 1,400 feet above Whitefish, Montana. Minneapolis couple Bick and Bonnie made the decision to escape the trappings of the corporate world and raise their son far beyond the reach of city lights. But where? The couple remembered riding a train out west to the picturesque town of Whitefish, Montana years earlier. 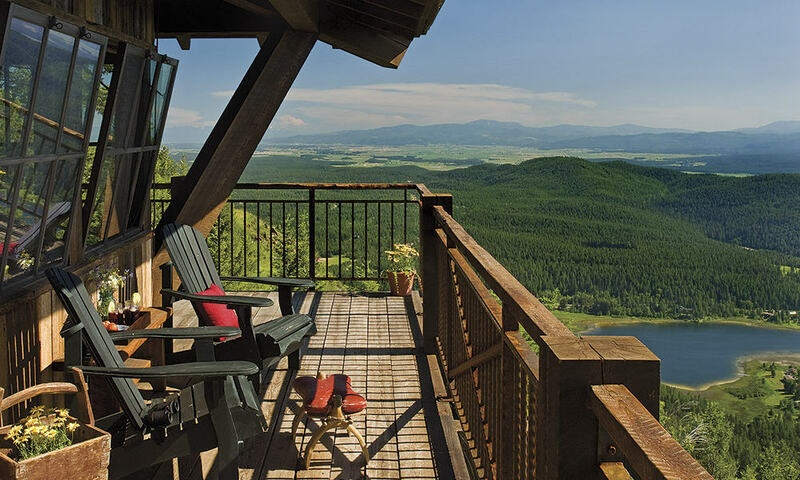 Whitefish, an artistic enclave and popular year-round destination for outdoor sports enthusiasts, is nestled in a glacial-carved valley amidst the Northern Rockies, not far from the Canadian border. Revisiting Whitefish convinced the couple that the small, vibrant, and tightly knit community–with its multitude of activities and opportunities–met all of their family’s needs and more. They selected a quintessential log home on Lion Mountain several miles from town and reconfigured it to better take advantage of the spectacular views: Flathead and Whitefish Lakes, and the awe inspiring peaks of nearby Glacier National Park, referred to by the early Native Americans as the “Shining Mountains” and the “Backbone of the World.” With a strong desire to share their new western lifestyle with friends and family, and the renovations on the main house complete, building a guesthouse became a priority. But not your typical guesthouse. Bick and Bonnie are fascinated with historical buildings of the early 1900s, particularly old fire lookouts. They found a creative partner and kindred soul in architect, Scott Elden, a man who in Bick’s words is “just plain gifted” in sketching dreams onto paper. The challenge was to create a replica of a fire lookout, one with the authentic feel of the real thing. Additionally, round compasses and alidades (devices used with compasses to determine the height, direction and distance of wildfires) would be replicated in the 14 by 14 foot space. Furnishings and amenities that would evoke and encourage a recreational environment were a must. Together the team pored over the design of over fifty fire lookouts, appraising their appearance, sight lines, aesthetics, size and height. Once the dream space was envisioned and plans were drawn up, it was decided that vintage lumber and hardware would be utilized whenever possible. When not available or appropriate (for example, structural beams needed to be new) the lumber and hardware would be aged to a patina that reflected an older pedigree. Restoration Hardware and Van Dyke’s Restorers proved excellent sources when original hardware pieces could not be sourced in early century homes and structures around Whitefish. 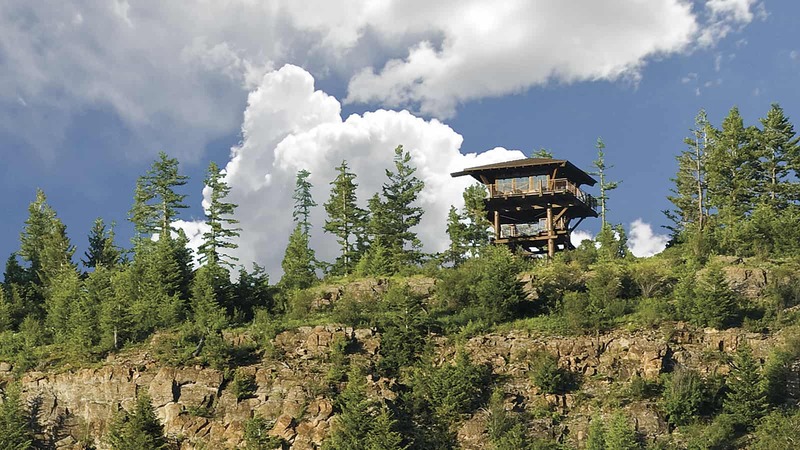 The lookout sits atop Lion Mountain with 360-degree views, on acreage fortuitously purchased from a cellular company. Much of the structure was built on the ground and then erected and set securely in place, its base much like a four-legged stool. Each “leg” is reinforced with rebar extending 14 feet into rock bed footing. Attention to historical accuracy was paramount down to the smallest details of the lookout. Flat head screws were selected over Philips screws, and exposed, braided cotton covered wires were used wherever possible, just as they were in earlier days. As in an authentic lookout, old-fashioned window sashes were built into the timber frames in a traditional manner, and accordingly, the windows tilt out to avoid glare. One design element that does differ from most other lookouts is the catwalk, which measures six feet, six inches rather than the usual three feet, allowing for both seated and standing room. 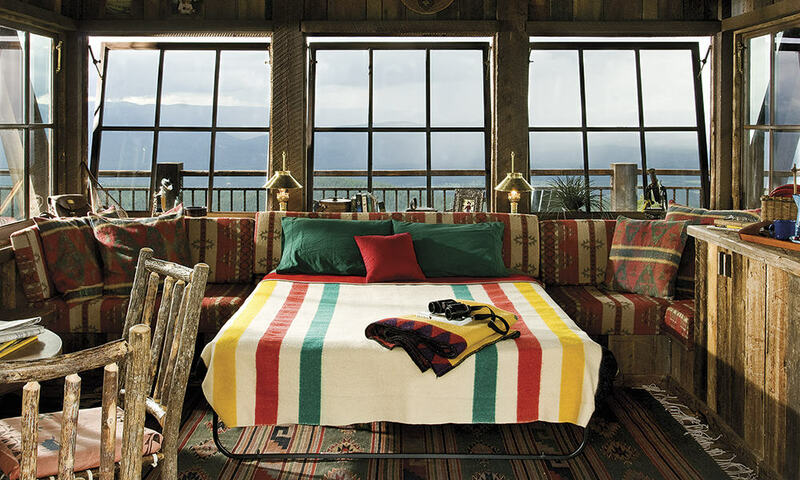 With the exception of the wide wrap around deck, the lookout is a dead ringer for an authentic forestry lookout. The view in each direction provides a unique perspective on the surrounding landscape. To the south is Flathead Lake, to the north, Big Mountain ski resort. The east affords a view of the gateway to Glacier National Park. According to the owners, “six horizons” loom along the western skyline. Bald eagles ride the thermals of the deep valley on one side. Grouse, wild turkeys, bear, deer and mountain lions share the surrounding wild habitat. A bunkhouse to be built near the base of the lookout is in the works. It will provide plumbing and an official powder room. The lookout currently has electricity but no running water. At the moment, a “Porta Potty” (one hundred feet from the base)requires a walk on the wild side should one need to use the facilities in the wee hours.